More than a month after local PE prices in China breached their highest levels for the past three to four years, prices are continuing to firm up as stock levels remain limited and plastic futures prices are trending higher. Although prices have been rising since the end of April, players comment that the market has not yet reached its peak, with one player stating that the fact that producers are still lifting their prices so close to the end of the month indicates that they are comfortable with their stock levels and are not struggling to meet their monthly sales quotas. 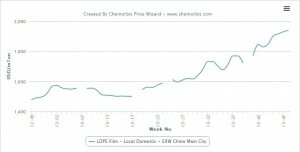 According to data from ChemOrbis Price Index, the most dramatic increases continue to take place in the LDPE market, which has faced steeper supply woes than HDPE and LLDPE and has consequently recorded larger hikes. LDPE prices on an EXW China basis have skyrocketed by $440/ton since the final week of April to reach their highest levels since 2008. 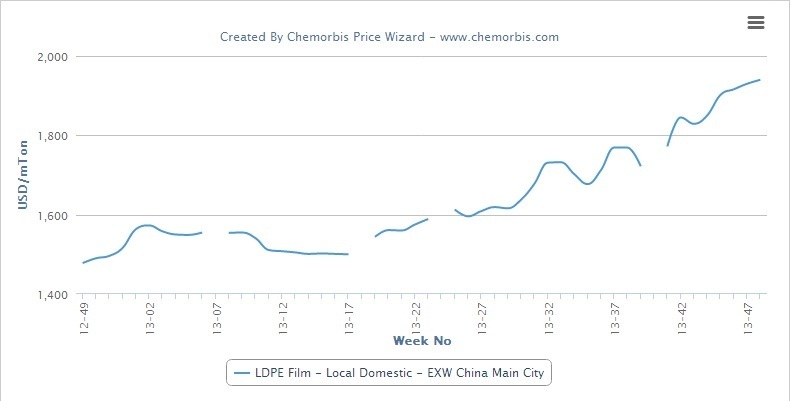 LLDPE film prices have also recorded strong increases, rising by a total of $265/ton since hitting their lowest point of 2013 in late April. HDPE film prices, meanwhile, have risen by around $100/ton over the same time period, with the comparatively modest rise in HDPE prices being attributed to relatively more comfortable supplies for this product.